Need a spare AV cable for your PS1, PS2 or PS3? Then you need one some of this retro goodness! 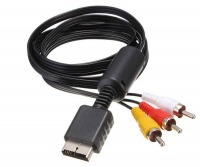 This AV breakout lead can connect your PlayStationn 1-3 console to most analogue TVs using the standard 3RCA Composite Video+Audio (Yellow, Red & White) AV connections. You'll only get resolutions up to 480i with this kind of cable setup (a limitation of Composite Video, not the cable), however you'll have broard conectivity with a range of TVs ranging from most new LCDs, to good 'ol CRT displays - for that authentic video look! Delighted with the prompt service and rapid deliver - thanks Cable Chick!